The Rumseian Experiment on its last voyage: the Hudson river on the bicentennial of the launch of Fulton's first steamboat . This might be too long to read, but where else would you read it? of 1987, to meet the bicentennial of Rumsey’s demonstration in 1787.
feet of cedar strip-planking, DuPont donated paint…and a valiant gang of Leechburg , PA handymen appeared and helped…it would take a lot of space to list all the people who lent a hand, but from the ones who stayed in the shop for days on end to the guys who stopped by after work everyday to just sand for an hour, there must have been around 100 people helping to build. It turned out to be a far more complex matter, to build an operational Rumsey steamboat. Rumsey had left parts out of his drawing of the engine, and had drawn others out of scale. He had never sweated the details, or bothered with an instruction manual. By August of 1987 we knew we were going to have a lot of further research and experimenting, in order to make the boat work, and on the September day we were to have it running, it wasn’t. We realized that we had to 1) discover the configuration of Rumsey’s original machinery 2) figure out how it could be run and 3) assess whether it could work or not. Done by a part-time crew, this took years. For the configuration, some things were easily discovered and fixed. The air pump was too small, and was replaced. The condenser barrel leaked enough to swamp the boat, and so we made another condenser . The trunkline turned out to be far too big, so we added smaller aperture, to make a jet of higher velocity (and when the greater trunkline pressure created a leak big enough to swamp the boat; we sealed the trunkline better). But some fixes took a very long time. The replacement of an anachronistic drop valve with the simple large turncock that Rumsey employed for a main control valve required making casting patterns, getting brass castings made and then machining them. The addition of the automatic valve linkage for the turncock (vaguely mentioned by Rumsey but never described) easily required a hundred hours. Figuring out how to run it took practice. Practice meant launching, and launching – and hauling out- were not easy. The Shepherdstown boat landing is steep, the ramp does not extend far into the river, and the current there is significant. Preparations for a run took around 90 man-hours. Launching the boat into the Potomac at Shepherdstown – and pulling it out- needed a truck with good traction, good river conditions, and a minimum crew of five guys who were fit and could curse fluently. Once we had steam, we would often go somewhere….but only with a lot of effort: with manning the feed pump and with dumping river water in the condenser, with pumping out the bilge,with keeping up a fire in the boiler, with yanking on the air pump rod when it jammed, and with the crew generally clambering around over the thing like ants and smoke billowing from the stack. Constantly attended, the Experiment would make an uncertain four knots on the water. If the current was flowing at six knots, of course we’d be working like crazy to go backwards down the river at two knots. And there was the maddening phenomenon of function being inversely proportional to publicity. If no one was around, the Experiment behaved itself beautifully. If a camera appeared, it started acting up; if a TV truck appeared, we’d be dead in the water for hours. Over time, as we got a better idea of how to run it, the design shortcomings and strengths became apparent. The boiler worked well. Other than the air pump sticking, Rumsey’s pumps presented few problems other than needing frequent cleaning and swabbing with oil. The flapper valves in the trunk seldom were clogged or jammed. The greatest problem was that the main control valve never functioned well; the turncock would stick when hot ( the poppet-valves used by Watt would not have done so) and a sticking main control valve meant that the automatic linkage seldom worked. In short, the engine never cycled itself well. It is quite likely Rumsey’s original had someone manually turning it, cycling the piston up and down. Whenever we were struggling with the machinery on the river , a bass fisherman or other kindly soul would often drift by and suggest we add a hidden outboard or other modern device, so we could actually go places in a hurry. It was well meant, but it was pointless. After a while, we all knew how we could build a better Rumsey steamboat. With English technology of a poppet control valve and double-acting steam cylinder circa 1795, we knew we could go places and have much more fun….but that wasn’t the point. We were re-creating Rumsey’s original boat, trying to see what it could have done, and creating another steamboat would have proved nothing. Over 20 years, from 1984 to 2004, the active Rumseian Society volunteers dwindled to a handful. Hard to run and exhausting to take out on the river, the Experiment took its toll. By 2006 it was also showing some age. Rot had spread from the stern, a survey discovered in 1995, and had been beautifully fixed by Joe Youcha and the crew at the Alexandria Seaport Foundation. But still, the boat was looking well-used. People visiting the boathouse often thought that the boat actually WAS the original from 1787. It was time to stop. 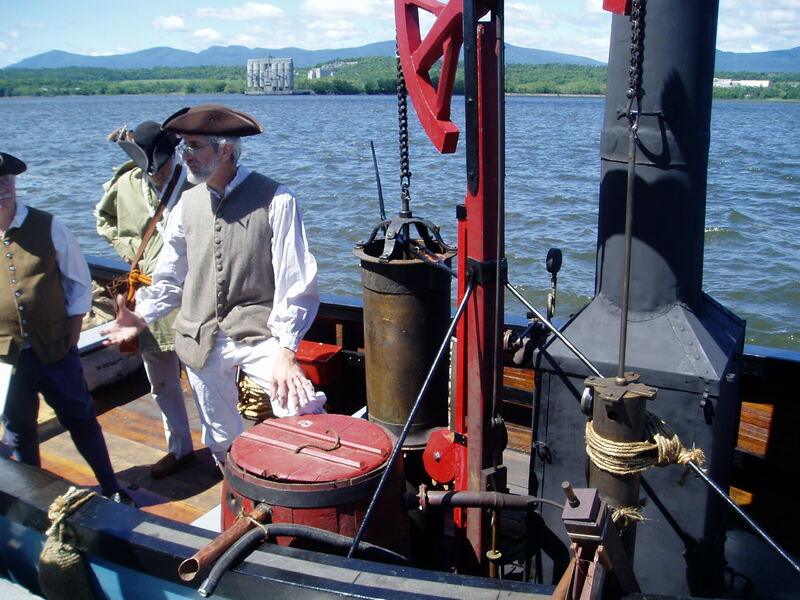 We bought it up to the Hudson river in August of 2007, and steamed in front of Fulton’s home, Clermont, 200 years after his steamboat had made its debut. And then we brought the Experiment home. After years of trials, it was obvious that Rumsey had taken on a very big task, and wasn’t quite able to finish it. 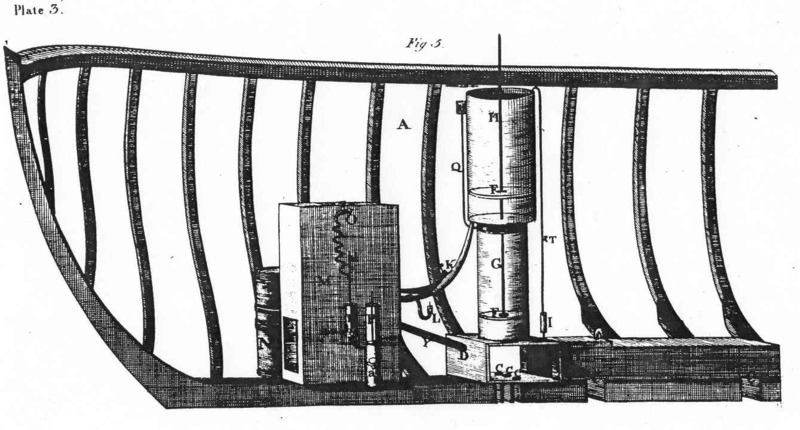 Unlike his rival John Fitch, he didn’t try to simply replicate a Boulton and Watt steam engine ( available only in England) and unlike Fulton 20 years later he didn’t simply import a Boulton and Watt engine. With no experience of steam engines, he had instead tried to invent one. Considering the task and his time and resources, he did not do too badly. His prototype did go. He solved one difficult problem very well- creating a very small-sized steam engine able to power a boat. His was likely the smallest 1 hp. engine in the world at the time, and his later engine designs were smaller. His strong and efficient water-tube boiler, that was key to this, would also become a standard feature of later engines. But Rumsey does not seem to have been aware of James Watt’s research on heat, and this lack of understanding of heat was a major impediment in this and his future steam engine designs. Anyone with experience with steam engines would never have used a simple turncock for the main control valve, certainly never would have expected it to be cycled automatically, and would have made the steam engine double-acting, to conserve heat. Another lack of understanding was that of turbulent flow; if you shove water around, lift and stop it, shove it back down, force it around bends, etc., you get energy loss from turbulence. Rumsey only thought he had a simple problem in Newtonian physics, where you only need to know how much a gallon of water weighs and how heavy your boat will be, and you can figure out the displacement of your engine. That he ended up with an engine that was less powerful than he needed , because of turbulence losses, he would have no way to know, however; Reynold’s work on turbulent flow would not come until the 1870’s. No, not a Hollywood ending, with us steaming into glorious sunset, Rumsey’s boat humming upstream like a ChrisCraft….but not a failure. 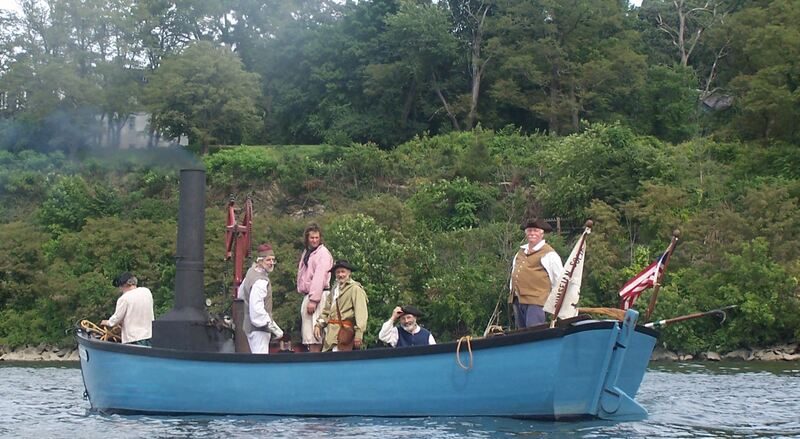 After we had come as close as we could to what our research had indicated Rumsey’s boat was, it ran just as his witnesses said in their affadavits in 1787. They said, “….it was with great pleasure that we saw her get under way…and move against the current at the rate of three miles an hour by the force of steam…We are well-informed, and believe, that that the machinery at present is very imperfect, and by no means capable of performing what it would do if completed”. Imperfect and incomplete it was, and must always be. We now know it ran, ran as they said it did, and so the Experiment experiment is concluded. We’d encourage anybody with a boat project. It’s important to keep in mind, however, that Rumsey picked jet propulsion because he thought it would make calculating the engine specs easy. He thought he had a problem in Newtonian physics, where he’d only have to consider the action of the stream of water equaling the reaction of the boat. But the pump lifting a bucket of water quickly , then stopping it and moving down and around a corner created serious losses of energy, as did fluctuating pressure in the trunkline as the pump alternately drew water in and expelled it. His 1 hp steam engine manages to get about 3 knots from the hull…intermittently. Jet boats today all tend to get a lot of water moving in only one direction. They also tend to get that water moving fast, as the speed of the boat will always be a fraction of, less than, the speed of the exit water…like jets and rockets. However, 5 knots is not fast, and a displacement hull takes comparatively little energy to move at slow speeds, and I would think that even a lawnmower engine of a few hp on a turbine pump should get that from a small hull of 14-17 ft. But I would suggest you look at the general history of jet boats. David S. Yetman put out a nice book on this some years back called Without a Prop, not a very expensive little paperback but it would give you a good start. I find the Rumsey story to be at once uplifting and sad. I have seen the replica boat during my last trip to USA. Like Ron above I would like to build a replica, steam powered but scaled down even further from the Experiment. I have built one boat, strip planked and powered by an American Frisco Standard 5 PH (1910 vintage) petrol engine. I currently work (volunteer) at the old naval shipyard at Cockatoo Island in Sydney, restoring the 1890s steam powered cranes. Would any of the Experiment crew be happy to pass on their knowledge and even a set of plans to work with. No point in inventing the wheel again. I doubt that I could feasibly do the build without the plans already used. 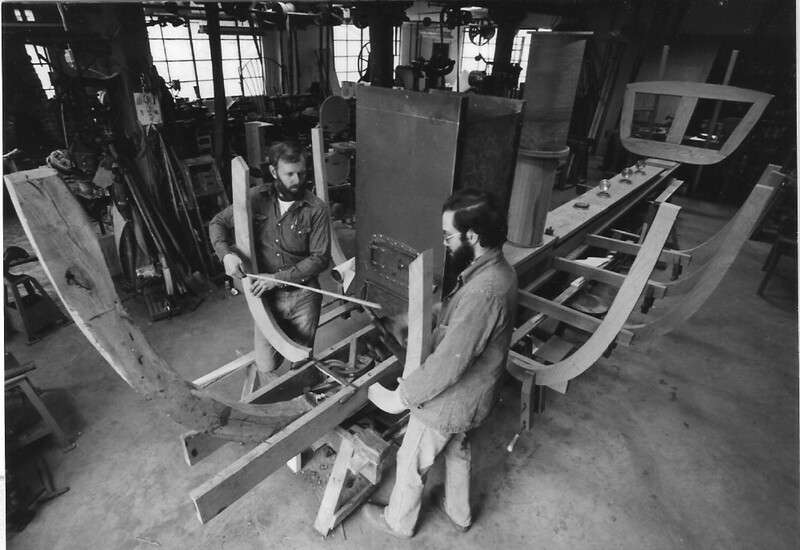 If I proceed I would do the hull build at the Wooden Boat Centre, Franklin, Tasmania, and the machinery fit out in my workshop back in NSW. I could make another trip to USA to confer with the local crew. This week I’m ordering my mill to cut the timber, which will need a year or so to air dry. Rumsey has been poorly treated, both in his lifetime and by historians. Well, good on ya for your enthusiasm. We’ve been very happy with the hull. It’s broad in the beam, shallow draft and has a lot of freeboard, which gave us a lot of safety from capsizing when hanging up on rocks in the Potomac, or drifting into dock pilings. It was strip-planked from eastern white cedar, on oak frames, and very robust, but that was done for convenience and durability- we are not entirely sure about the construction of the original. The engine: Rumsey needed to make a beta version, and never did. We call our the Rumseian Experiment for a reason. Almost constantly, the control valve binds up and has to be cleaned, the boiler runs out of steam, or runs dry, or gets waterlogged, the condenser overheats and needs a bucket of water, the air pump piston binds and has to be yanked free. We got 3 intermittent knots out of it, and worked very hard to get that. You would not find it a very fun craft to operate. If you dropped some of the original design, used a Watt-style drop vale or poppet valve instead of a turncock, returned the condenser water to the boiler, made the steam cylinder double-acting, maybe even made a 2 cylinder version that could generate a constant stream of water- you might have something of a pleasure craft, good for a slow river, lake or quiet harbor. But you’d cease to demonstrate the original design. Still, the hull would work at 3/4 or even 1/2 scale. We have some ( though not all) of the drawings done by Bill Hunley, the architect, and the half-hull. If you would come all the way from Sydney, you’d be most welcome; all of that you’d be welcome to look over and use. We’d be happy to talk about engine design, show you what we have. As far as planning, though: if you started work on your engine, and ordered the timber from the mill at the outset, by the time you’d got something working and tested your wood likely would be dry enough to use for making the hull..
Well thanks for that. I had already decided on some improvements that would not detract from Rumsey’s concept. The valve obviously has to improve. I think a fire tube boiler would more likely suit this style of engine – less likely to cycle up and down. We could play around with the relative sizes of the water and steam pistons – they don’t have to be the same size. Fairing the insides of the water channel would help but getting an increase in stroke rate is what I would really aim for. My hull preference for the hull would be strip planked/double diagonal. My timber will be eucalyptus grandis, not a real traditional boat timber but we have lots of it growing and can get anything up to 60 feet clear planks; too many damned scarfs in my last boat. I’ll hold off on design work until I’ve decided on hull size (and that depends on access to your plans) which will determine to a large extent piston and boiler sizes. I roughly plan to start work in 2 years from now.